OSS/BSS Vendor Satisfaction – Are “Product Companies” Missing the Boat on Delivery? Current Analysis collected responses on OSS/BSS purchase drivers and vendor satisfaction from large operators around the globe representing approximately half of the global telecom CapEx spend. The companies that topped the list in questions related to vendor satisfaction seem to be better known as large SI players than as OSS/BSS specialists. The funny thing about surveys is that while nearly everyone is interested in the results, most also view them with a “take with a grain of salt” attitude. So, as one of the main people at Current Analysis responsible for designing, conducting and reporting on the primary research surveys that we do aimed at telecom networks, I have grown somewhat used to folks being selective about which results resonate vs. which ones get dismissed. Accordingly, I have also grown more comfortable in reading the tea leaves as I see them and retaining my sense of professional self-worth when folks take my analysis with the aforementioned bits of sodium chloride. 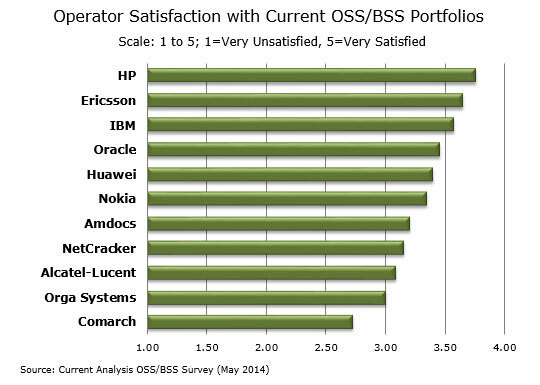 So without further ado, here is a key result from our recent OSS/BSS survey and some “read between the lines” analysis that I have pulled out: network operator satisfaction with current OSS/BSS portfolios. When I first looked at this chart, my initial thought was: “I can’t wait to tell HP, Ericsson and IBM.” My next thought was: “Who can I get to tell Amdocs and NetCracker?” It is not just an issue of “winners” and “losers.” It is also about credibility. After all, if looking solely at OSS/BSS products, one would expect Amdocs and NetCracker to be rated near, if not at, the top. I mean, a couple hundred operators each buy a lot of stuff from both Amdocs and NetCracker, right? Aren’t they two of the market leaders? Then, I thought harder, and the thing I remembered is that we didn’t ask: “Who do you buy from?” We asked: “Who are you satisfied with?” Here is where there is ample room for interpretation. Do these results suggest that operators buy from some very well-known names, even though are not necessarily in love with them? Perhaps. But, I know a lot of people at a lot of operators and most of them that know OSS/BSS have good things to say about Amdocs and NetCracker. So, I’ll discount that. Instead, my read on these results is that there are two main pillars of an effective OSS/BSS portfolio; 1) software; 2) services. All the players on list have both, though to greatly varying extents when it comes to services. And therein lies the proverbial “rub” – at least in my mind. Yes, all three vendors at the top of the list have OSS and/or BSS software offerings. Yet, where these are not all “comprehensive” offers (at least with IBM and HP), all three at the top of the list are very well known for professional services – particularly, in this case, the ability to serve as the prime integrator in large systems integration efforts. (Yes, the vast majority of Amdocs revenue comes from services, but at its core, it is still known as an OSS/BSS product company). So, what is the key takeaway? I hear a lot of OSS/BSS vendors beam with pride that that they are “product companies,” with the clear implication being that operators value the product more than the SI that comes in and pulls it all together. That is a good story. However, our results say that delivery matters most. I do a lot of custom work for our clients and I know that you can do a lot of work and put together some great insights (and slides), but if you flop the delivery, the project will not succeed. The same holds with software. The best written code will still leave the customer cold without effective delivery. Isn’t this what companies such as HP and IBM stake their reputations on? No need for tea leaves here. The answer is an unequivocal “yes.” And, at least in this case, the market seems to like that about them.